Several years ago, digital marketing buzzwordians invented the term “storytelling” as a new way to advertise that wasn’t so “addy.” No more boring product ads, we’ll tell a “content” story! But then, about a million creatives reminded the buzzwordians that many of the best and most memorable brand ads in history told stories, and, no thanks, we don’t need a not-new term for this not-new strategy. The buzzwordians paused, briefly, to contemplate this and then invented the more nebulous terms “story-doing” and “story-scaping” advertising. This time, the creatives just blankly, silently stared back, defeated. Meanwhile, the digital marketers have not abandoned “storytelling.” Oh, no. They’ve taken — and continue to take — a lot of business away from “traditional” agencies with their “engagement” metrics PowerPoints. Plus, “Storyteller” was already in way too many people’s titles and bios, and they weren’t about to give up that creative-sounding word from their business identities. Today’s digital marketers’ version of storytelling is sponsored content that they say more deeply engages the consumer without selling the brand. It’s not “soft sell”; it’s more “no-sell.” Image awareness advertising — previously known as soft sell — is now blunt-force hard sell. And product benefit ads? That’s so, like, last century, troglodyte. The big problem with this type of storytelling ad is that even the people who remember and like the story often don’t remember the brand (unless there are Red Bull logos all over the guy’s spacesuit), never mind discovering a reason to buy the product. 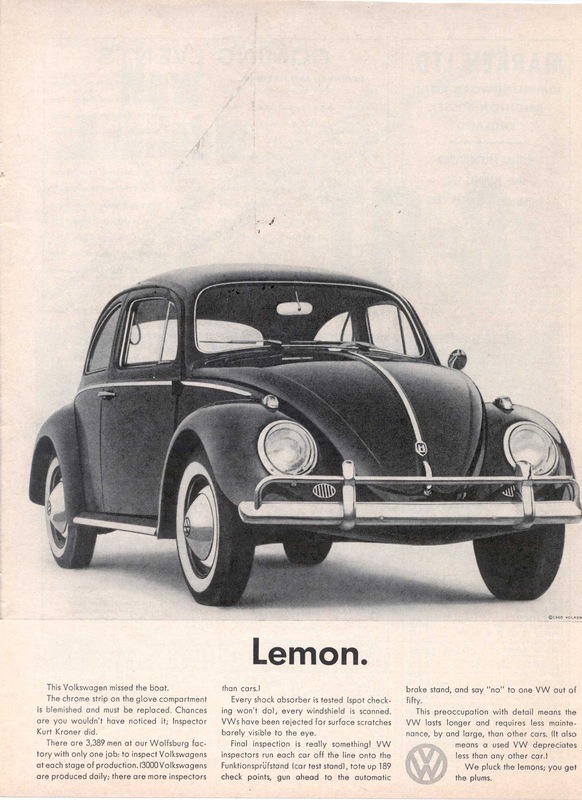 But copywriters and art directors have been telling good stories in ads — ads that sell — since about when this ad broke that told the story of a VW Beetle that missed the boat because of a blemished chrome strip. The “story” doesn’t have to be several minutes or hundreds of words long to be good entertainment. Gather round and watch three good, entertaining storytelling ads, all 90 seconds or less, all of which sold the crap out of the brand. Simply, one of the best beer commercials ever produced (agency: Lowe Howard-Spink, London), tied off with maybe the best beer tagline ever: Refreshes The Parts (Wot) Other Beers Cannot Reach — the “wot” was thrown in here to customize the tag for the spot. The ad was of course mocking “My Fair Lady,” which is funny enough on its own. But the “Majorca” part was a very inside British joke, deepening the “engagement” even further. You can read the full backstory here. This Argentinian ad (agency DraftFCB, Buenos Aires) would never stand a chance in the USA. But luckily, the spot speaks the international language of dark humor. Were you not engaged? Again, one of the best jobs site ads ever made, right up there with Mullen’s Monster.com 1999 ads. Publications are not easy things to advertise well. But the Guardian (and its then-agency, Boase Massimi Pollitt, London) brilliantly nailed it and cleanly separated itself from the competition. More recently, its 2012 “Three Little Pigs” spot followed the same “whole picture” strategy, though executed with a much more extravagant story (agency: BBH, London). Look at that: Selling and storytelling, commingling like they were meant to be together. Does advertising even work any more?